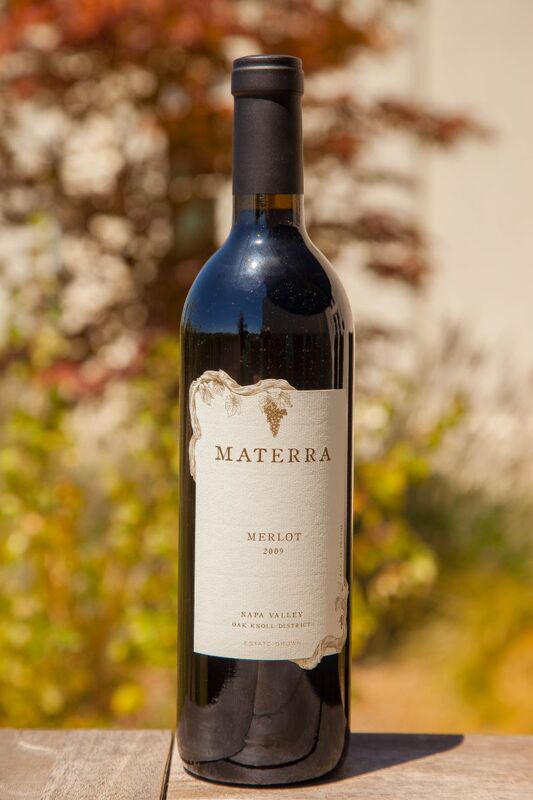 Materra means Mother Earth in Latin and is the name of a Merlot focused vineyard that California Girl and I recently visited. 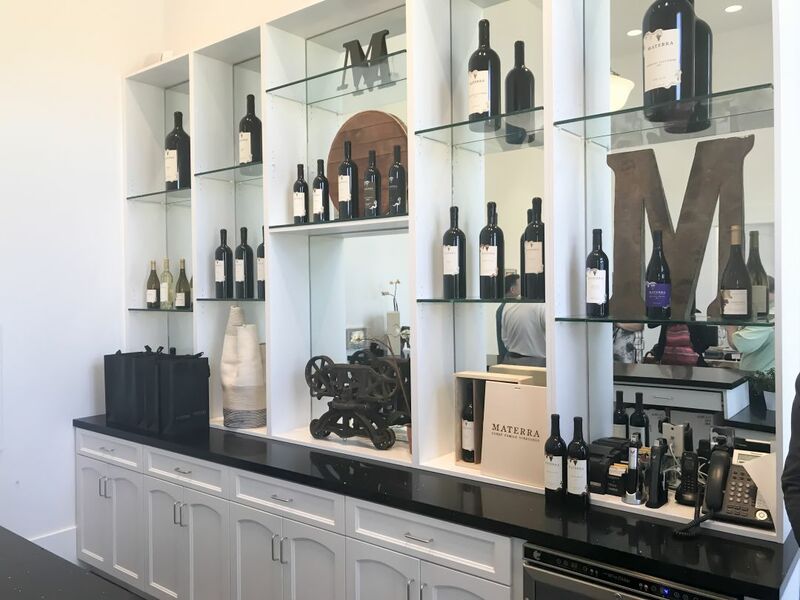 The vineyard and the tasting room are just outside of Napa just off Oak Knoll Road, one of the routes that link Silverado Trail and Highway 29. The occasion of our visit was a tour of the facility and a lunch to showcase the wine that they make. On arrival, we were led into the tasting room, a modern space with white wood and black marble. We were given a taste of their Sauvignon Blanc as the owner, Brian Cunat, described the wines and his vision. The Sauvignon Blanc had a vibrant nose dominated by peach. The mouthfeel was soft with flavours of apricot, gooseberry, and some spice; all backed by a hint of minerality. The wine is made entirely in stainless steel, using the Musque clone. California Girl Comments: I loved the elegance of this Sauvignon Blanc. It really reflected the clean modern space we were welcomed into. Because of its ripe stone fruit flavor and minerality, I could imagine serving it with a pork tenderloin. 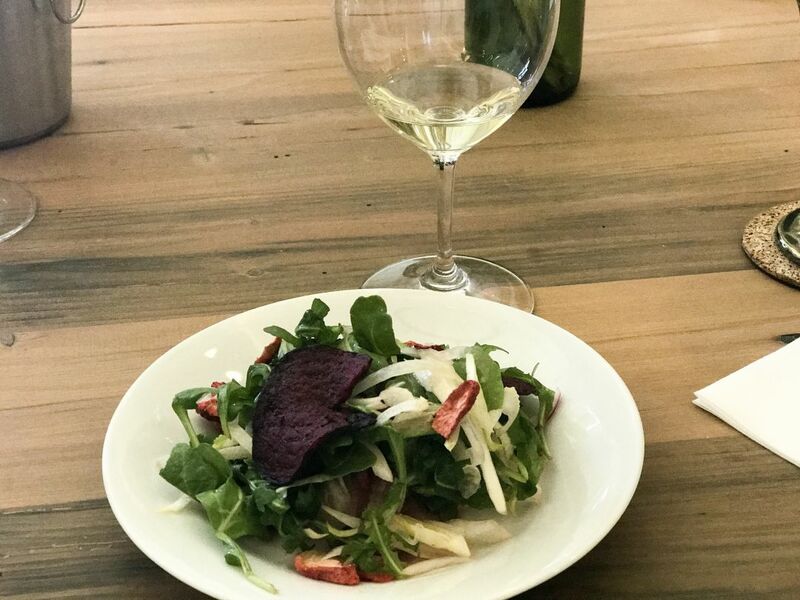 A side of mixed green salad, goats cheese and nuts and we are talking the perfect pairing. Brian purchased the vineyard in 2007. Until that point, the grapes had been sold. Over the course of the next few years, the vines were all replanted, with Merlot, Chardonnay, Malbec, Sauvignon Blanc, Petit Verdot, and some Viognier. 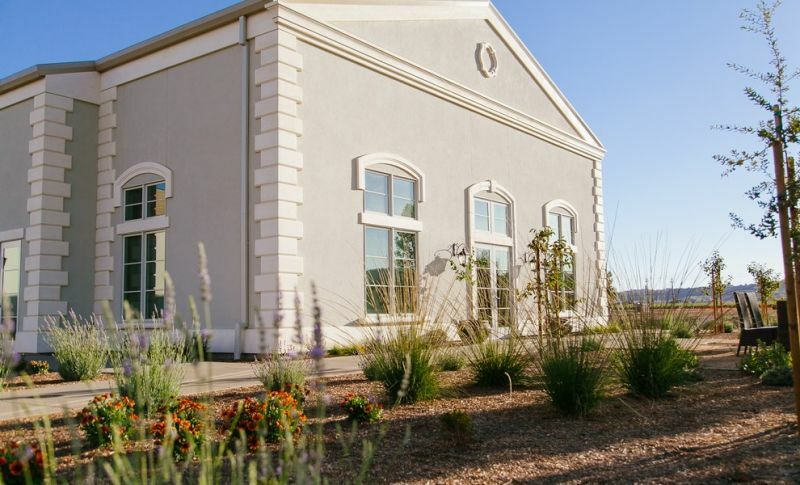 The replanting combined with the building of the winemaking facility on site gave Brian and the two consulting winemakers a blank slate with which to work. The focus is on creating old world style wines, but with Napa fruit. The second wine we tasted was the 2015 Materra Chardonnay Reserve – specifically, the Materra Southworth Chardonnay Reserve. The nose was an enticing mix of lemon and apricot with notes of vanilla. Medium plus acidity accentuated the fruit driven flavours of apple, white peach, and lemon; all leading to a long finish. Fermented in 60% new French oak and 40% neutral oak, and no malolactic fermentation. 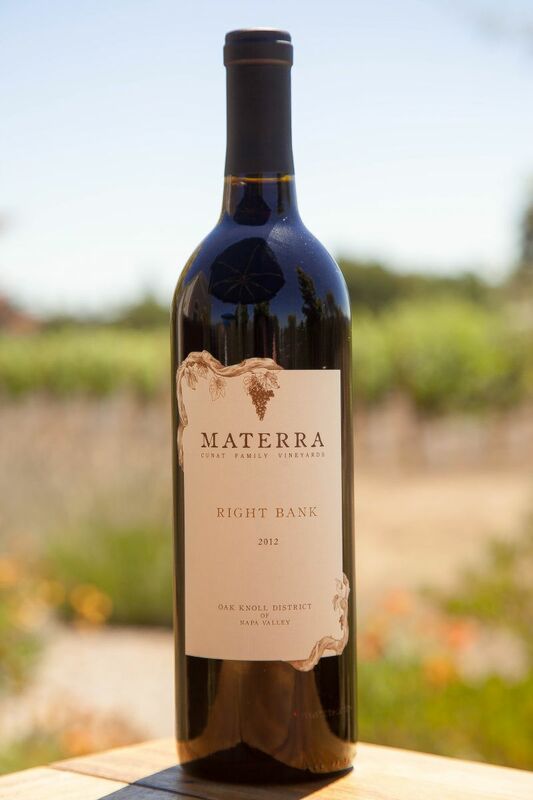 The Materra vineyard covers seventy acres from Silverado Trail to Big Ranch Road, spanning the Napa River and bordered to the South by Monticello Vineyards. Sixty acres are under vine. We were taken around the facility that and I was struck by the high-tech approach. The stainless steel tanks can be monitored and controlled remotely by cell phone apps. There is an automated press on a gantry. The temperature in the barrel rooms is also controllable remotely and the rooms have multiple zones, enabling different wines to be held at different temperatures. One zone can be lowered all of the way down to freezing. This level of automation enables the five thousand barrels to be managed by just three people. Lunch was served in a room adjacent to the library storage that Materra use. The storage room was glass-walled, giving us a view of the bottles covering vintages back to 2007. All of the vintages are available to club members. The floor of this room has a glass panel that allows you to look down on the soil of the vineyard. Lunch started with a plate of four kinds of cheese. The first was Mimolette from France. This had a notable saltiness and a distinct nuttiness. Apparently, the flavour is due in part to mites that live in the rind of these cheese which is aged for eighteen months. 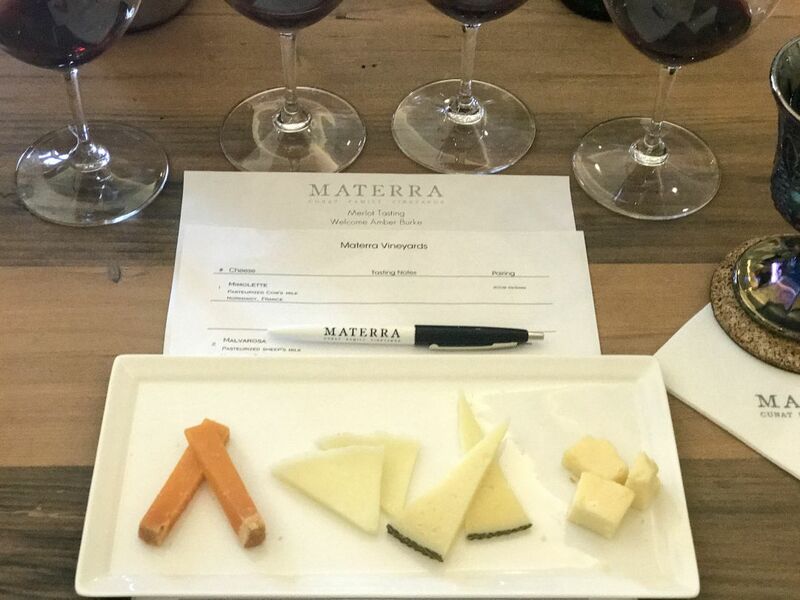 The Mimolette was paired with the 2009 Materra Merlot ($40). The wine had a high-intensity nose, with redcurrant supported by a backbone of oak. The tannins were softened by age and the wine was a fruit blend of cranberry, plum, with a spicy kick of cinnamon in the mid-palate. California Girl Comments: I loved the wine and cheese pairing portion of the meal. I had of course on many occasions had wine and cheese pairings, but I felt that these pairings were perfection. You got the best out of both the wine and the cheese. 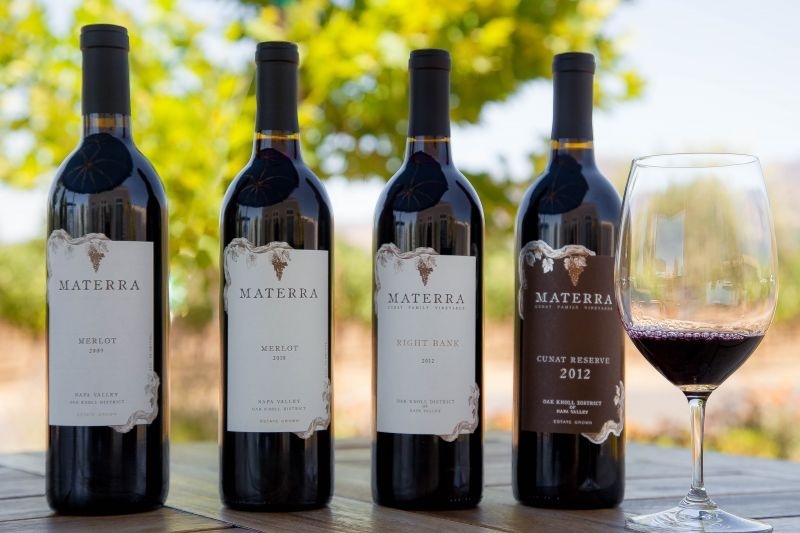 California Girl Comments: A first tasting of the 2010 Materra Merlot and I was in love. For me, Merlot is much maligned and ignored here in Napa and its a shame. Good Merlot is something to behold and for me, it is every bit Cab’s equal. What a great sip at an affordable price! The penultimate cheese was another Spanish delight; Campo de Montalban, a mix of sheep, cow, and goat’s milk This was described as an all round workhorse cheese. It was paired with the 2012 Right Bank ($50), a Merlot heavy blend. The 2012 vintage was the first year that wine was made from the vines that the Cunat family planted when they purchased the property. The nose was of medium intensity, notably less intense than the older wines. It offered aromas of toffee and blackcurrant. The mouthfeel was again silky smooth with punch tannins wrapped in plum and blackberry. The finish added a delightful minerality to the mix. Notably different from and had to rank against the earlier vintages. California Girl Comments: This was my favorite sip of the day. Complex and beautiful, and quite weighty in the mouth. My mind wandered over all of the beautiful dishes I could create around this wine. This is such a foodie wine, it was hard for me to think of only a single pairing. I finally settled on a seared duck breast with a blackberry glaze and a cauliflower puree. The last cheese was my favourite of the quartet; Snowfields, Saxson Creamery in Wisconsin. Made with winter milk and aged up to five months, small lactate crystals created a texture contrast and the slight sweetness worked extremely well with the 2012 Cunat Reserve. A medium intensity nose of fruit, leather, and spice served as a prelude to a smooth sip. Rich and round, with the promise of lush fruits and tingling tannins, this was a wine that justified its $110 price with each sip. California Girl Comments: I want to say all of these sips were favorites. They all had distinct character and body to them. 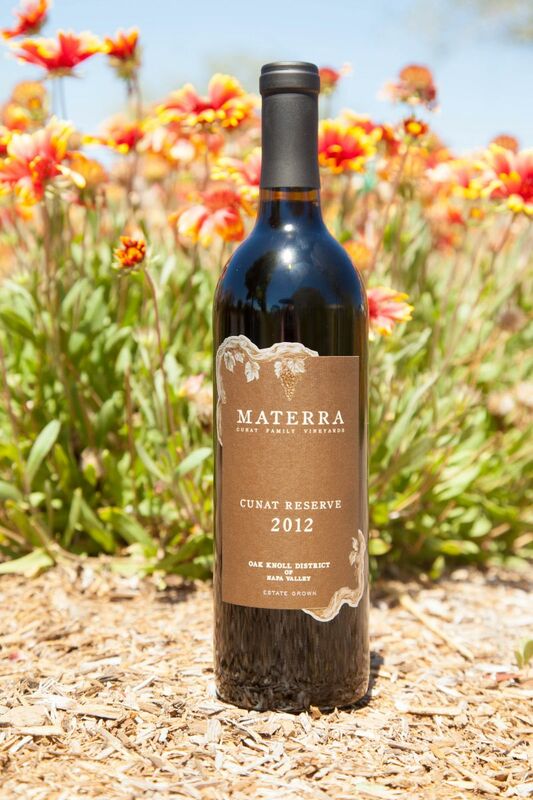 This one just solidified my love for Materra wines. I hope making excellent Merlot becomes popular once again. The cheeses were provided by Atelier Fine Foods in Yountville. California Girl and I have added this store to our places that we must visit. The first course proper of the meal was an excellent salad, paired with the Reserve Chardonnay that we had tasted at the start of our visit. With food, the acidity was less pronounced and the slight creaminess was more noticeable; a clear demonstration of how food changes the perception of a wine. California Girl Comments: I liked the Chardonnay. It had a nice balance to it. It paired beautifully with the food, but I could also imagine drinking it on its own. The wine has an oily texture to it, which was to me very pleasing as it slides over the palate and gives a silky feeling. 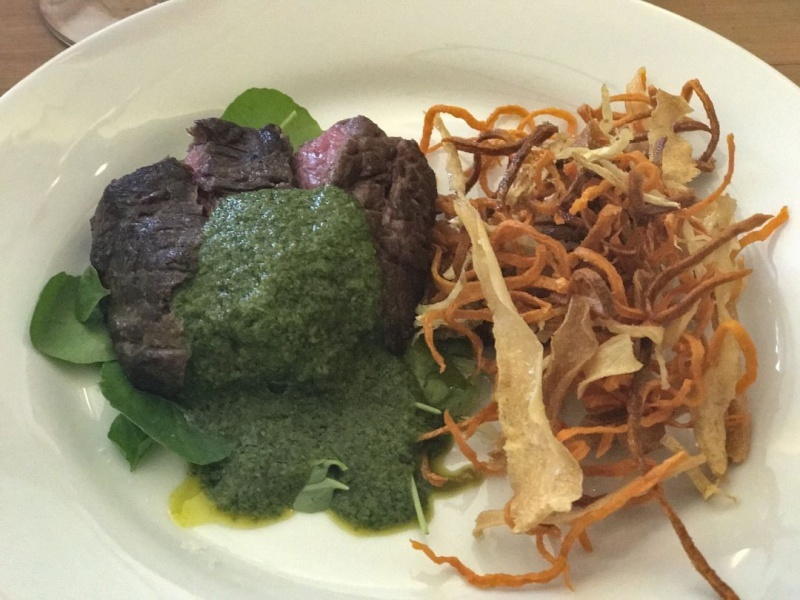 The main course was Wagyu beef served with a taste of the 2013 Right Bank. The nose was a high-intensity blast of blackcurrant. Medium acidity was balanced by a tannic combination of leather, plum, and cassis. On the finish, the tannins left a distinct impression of black tea. The wines, especially the Merlot and Merlot focused blends, were impressive. In Napa, Merlot plays second fiddle to King Cab. 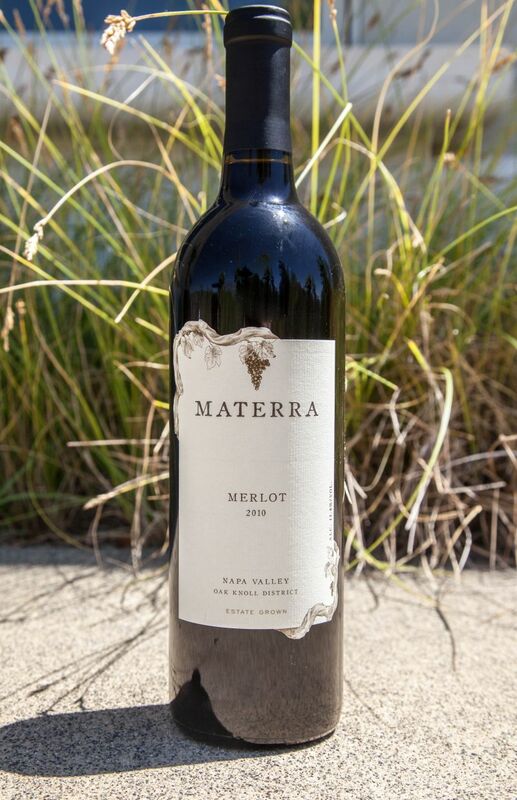 The Materra Merlot show, however, that if you can brush aside any anti-Merlot prejudices, it is a grape that can hold its own in making complex wines that can age. The grape’s lack of status in Napa, moreover, means that these fine wines cost significantly less than most Napa Cabernet Sauvignon. We look forward to future visits to this hidden gem of a winery. The glass floor sounds so cool!